The CoffeeShop Blog: Soap-Making Adventures: Chamomile & Honey Shampoo and Body Bar Recipe! 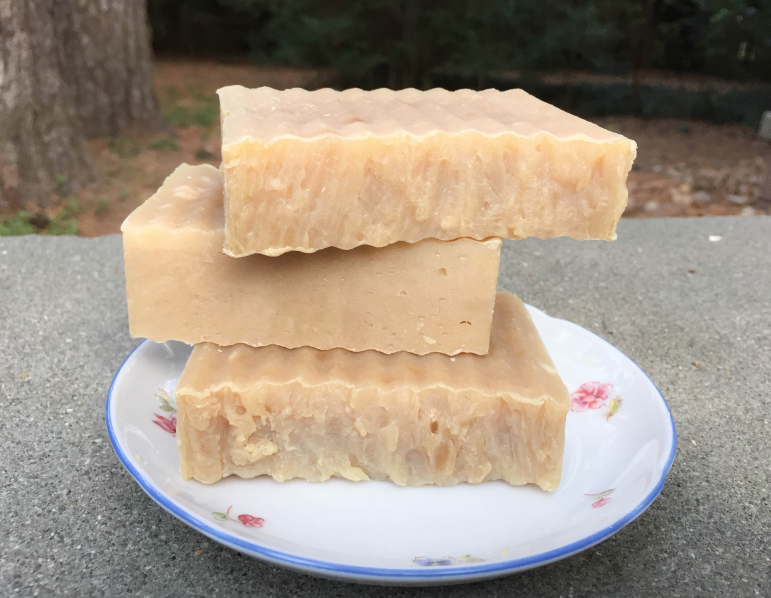 Soap-Making Adventures: Chamomile & Honey Shampoo and Body Bar Recipe! I am still loving crockpot hot process soap-making and wanted to share my new soap recipe. You still have time to learn how to do this and make some lovely soap for Christmas presents. Don't be scared of the lye!!! Now that it is cold outside I mix the lye into the water on my stove with the vent running (using gloves and safety goggles) and it works perfectly. You can read my last post about my soap-making tips/tricks. To get you started, I would suggest making this shampoo or body bar. It is so easy since it only uses one oil (coconut) and it is ready to use that day. Then I would suggest trying this recipe (I love the pumpkin version because it smells like pumpkin/banana bread). And then check out the Nerdy Farm Wife soap recipes. I ran across this Chamomile Tea & Honey Shampoo Bar recipe and though it sounded lovely. But now that I am such a soap-making pro (NOT!) I decided to tweak it. I wanted it to add more coconut oil (that makes a very bubbly hard bar less likely to dissolve in the shower), add some jojoba oil to make my hair shiny, and remove the sweet almond oil (because I was out). 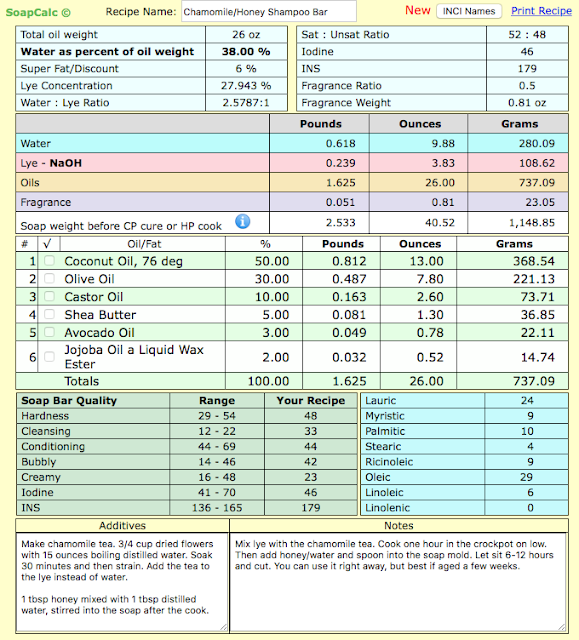 I can do this with confidence thanks to SoapCalc. I used the crockpot method and calculated the batch for 26 ounces of oil (using this calculation) so the finished soap would fit in my new soap mold. 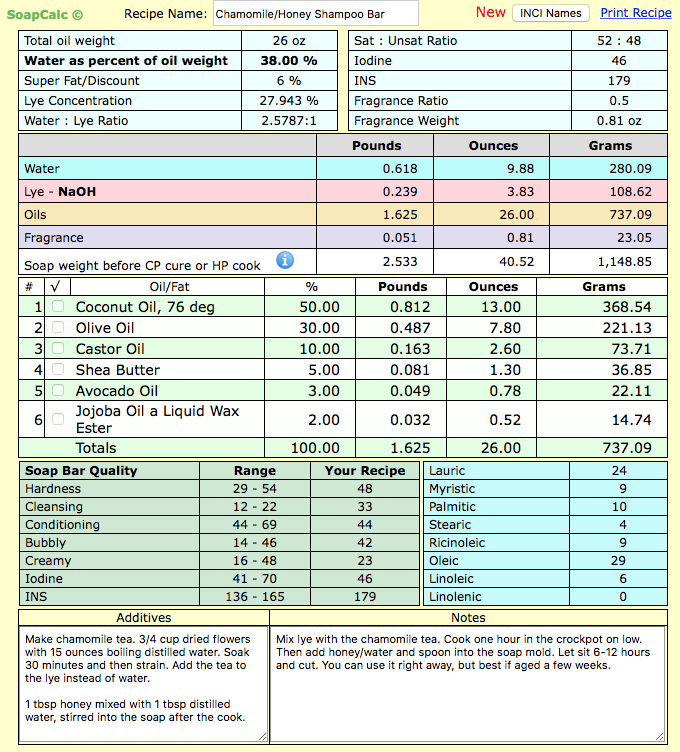 I am really proud that I already feel confident enough to modify soap recipes to make my own version, thanks to SoapCalc. And this one turned out great! It is very pretty, bubbly, smells lovely, and is nicely moisturizing on my skin. I think I prefer the coconut shampoo bar for my hair (more moisturizing for winter), but this soap is amazing for a face and body bar. And it also gets my husband's seal of approval for hair and body. When we shampoo our hair with any shampoo bar we usually spray apple cider vinegar diluted in water (1:4) on our hair and rinse it out after the wash for additional conditioning. 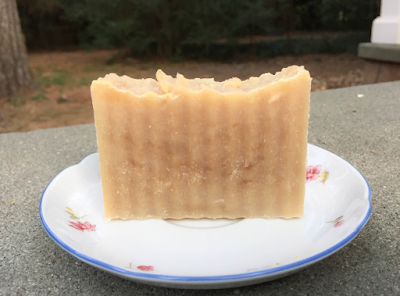 I love the look of hot-process soaps (slightly mottled and homespun), and since I am addicted to soap-making I have a large pile of soap "aging" in my bedroom. So I am forcing, oops I mean gifting, soap to friends and neighbors this month. I usually wrap it with a pretty piece of paper and string, but I wanted something practical AND pretty. 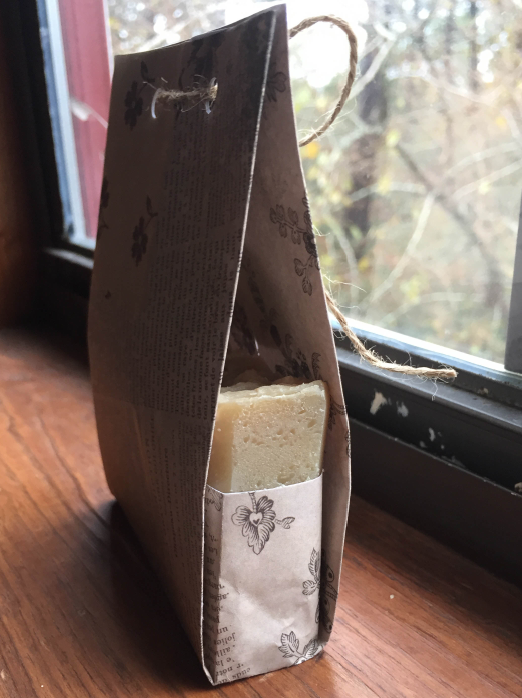 My older son and I watched this video to learn how to make soap gift bags and they are so easy! He is a paper-folding expert and had to help me with some of the folds, but once you figure it out it is very fast and you can customize it to fit your own soap (or other small gifts). I bought some 12x12 scrapbooking paper from Hobby Lobby (with my 40% coupon!) and ribbons and strings so that my bags would be really "fancy". These bags don't need to be glued or taped and they are open on the sides so you can see and smell the soap. It costs me less than 10 cents a bag, so it is very affordable. 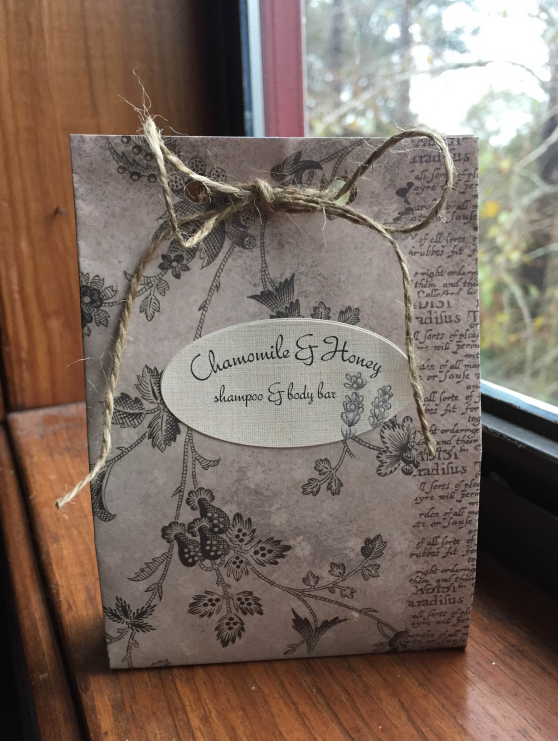 You are welcome to click and print my Chamomile and Honey soap recipe below if you want to try it yourself! You can actually read all of the "Soap Bar Qualities" on the bottom of the form. Pretty cool right? The science geek in me loves all of these numbers. This was created on SoapCalc. Questions or advice? Please leave a comment. If you make your own soap I would love to see it! You can post photos on my Facebook page . Glad to see that you are still having fun with it all. Your bags turned out really pretty. Good luck with your continued soap making adventures! Thank you Lisa! I love those little bags. And I love soap-making!!! The soap looks and sounds lovely! I can't wait to try it.